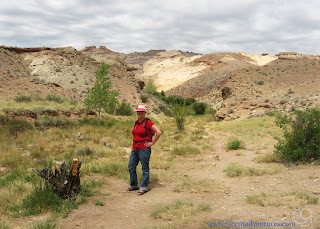 Description: Black Dragon Canyon is virtually unknown compared to other features in Southern Utah. But that doesn't make it less interesting. 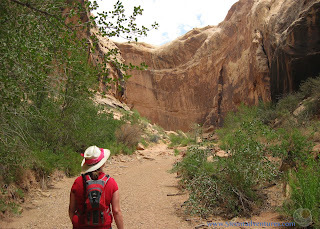 This canyon has steep sandstone walls painted with desert varnish. 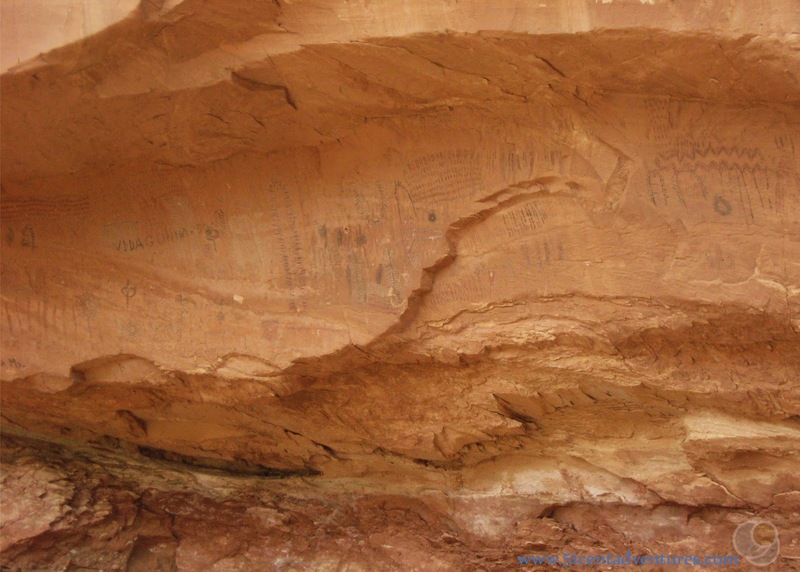 A short hike up the canyon leads you to ancient rock art. There are at least two caves located in the canyon. The canyon's close proximity to I-70 makes it an easy side trip. 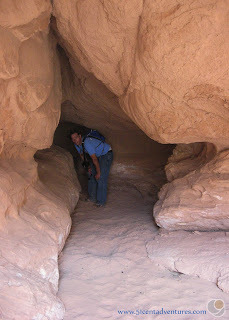 Location: Black Dragon Canyon is less than 15 miles west of Green River, Utah, and only about an mile from I-70. It is located on the eastern face of the San Rafael Swell which is often referred to as the San Rafael Reef. Operating Seasons and Hours: There aren't any official hours, but exploring will be much easier in the daylight. Black Dragon Canyon is a place my husband and I discovered while returning from a weekend rafting trip to Moab, Utah in 2012. However, if we'd known about the canyon during our Southern Utah Road Trip in 2010 I'm pretty certain we would have planned a visit. In fact, I'm positive I would have completely changed our route home in 2010 if I'd known about the amazing destinations within the San Rafael Swell. Instead of travelling north through Colorado to get to Vernal we would have gone west to explore the unique and yet almost unknown features of the swell. On this alternate route we would have left Crystal Geyser in Green River, Utah and driven 15 miles west to Black Dragon Canyon. 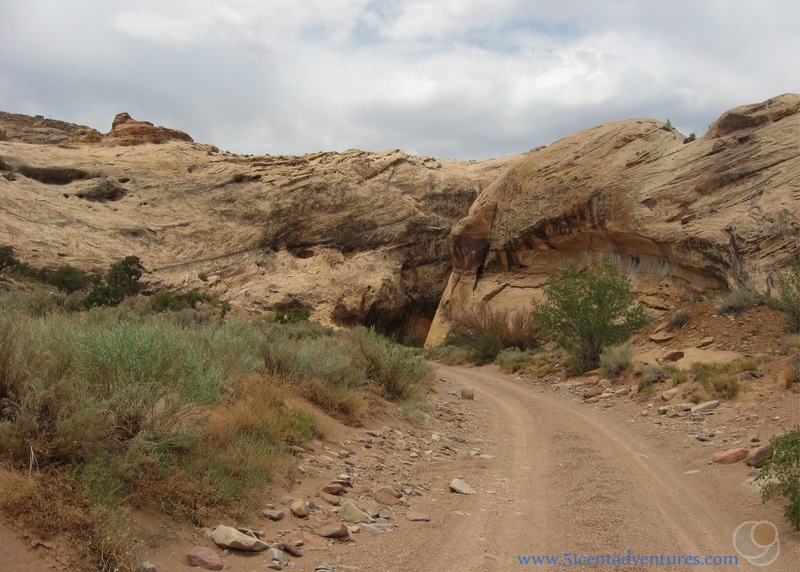 My husband and I had each traveled from Salt Lake City to Moab, Utah before, but it wasn't until the trip in 2012 that we really noticed the San Rafael Swell. As we drove on Highway 6 from Price to Green River we were captivated by the strange shapes of the mountains to the southwest. I checked over our map, but couldn't find any information about the mountains. We'd picked up some travel brochures at a rest stop near Price, and one of the brochures said that the mountains were part of the San Rafael Swell. I'd heard of the swell in my college geology class, but I'd only associated it with Capitol Reef National Park. I didn't know it extended past I-70. 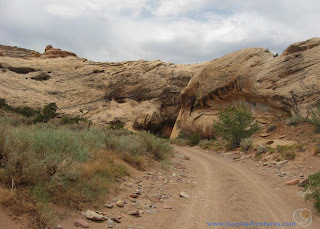 We continued on to our weekend in Moab, but when it was time to go home on Sunday we decided that rather than travel back on Highway 6, we'd take the longer way home and travel through the swell on I-70. Both of us were really excited about this detour because we'd be driving on a road we'd never driven on before - and neither of us can resist exploring a new road. We were also excited because this trip was a chance to get away from our three children and reconnect as a couple. Deciding to travel through the swell was a nice reminder of all our pre-children adventures. Since our map didn't even have the swell noted on it, we consulted our trusty stack of brochures to see if there were any interesting places to stop along the way. 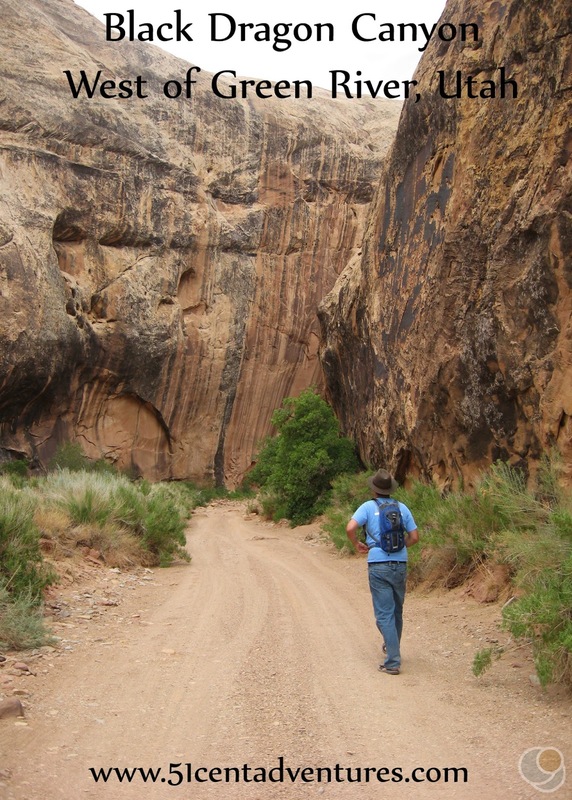 One brochure was for a canyon that wasn't too far from I-70 named Black Dragon Canyon . We never would have found the canyon without help from the brochure. For one, neither of us had ever heard of Black Dragon Canyon. For two, the instructions to find the canyon required us to do a lot of stuff that we never would have thought to do on our own. The instructions on the brochure told us to drive west on I-70 to mile marker 147 and then turn right onto a dirt road. There wasn't an exit ramp or anything like that so turning off the interstate onto a dirt road felt really weird and almost illegal. The brochure then instructed us to go through the gate that was on the road. This also felt pretty wrong. I never would have thought, "Hey. 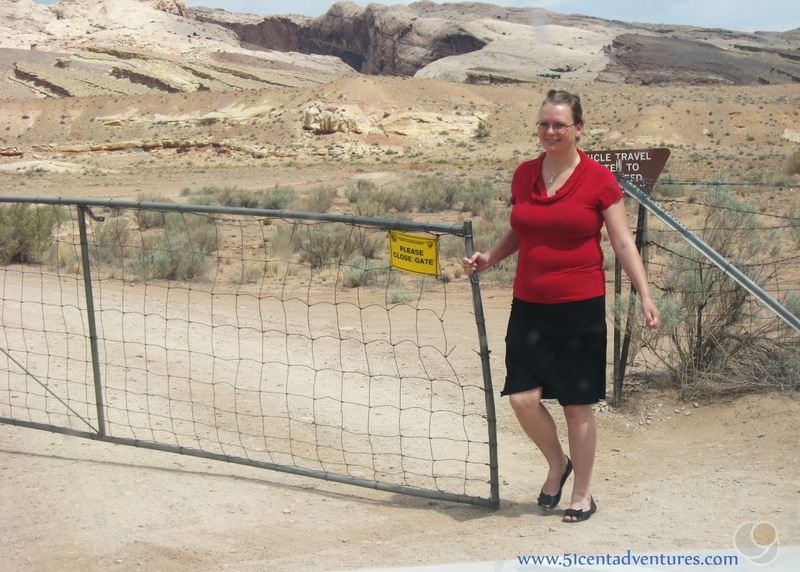 let's turn onto this dirt road, and then go through this gate." I would have thought we'd get shot for trespassing. starting our adventure, so that's why I'm wearing a skirt. 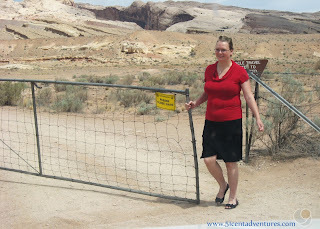 The brochure told us to go one mile past the gate, and that the canyon would be to the west. We drove a mile, but we were a little unsure if we were in front of the canyon. The brochure had mentioned a jeep trail and this canyon looked pretty overgrown. Still, we decided to check it out. My husband and I changed from our church clothes into more appropriate hiking clothes and were on our way. We quickly realized we were in the wrong canyon. 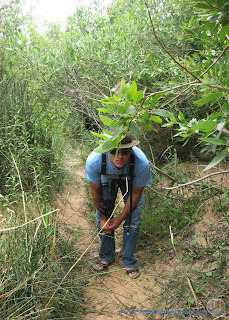 The trail lead us to a small cliff that we had to climb over. After we passed the cliff the trail was over grown. 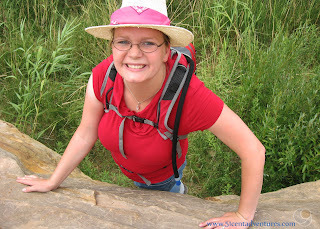 It felt more like an animal trail than a hiking trail. The canyon was also very humid. We back-tracked out of there. We drove about another 1/4 of a mile down the dirt road and found the correct canyon. The real Black Dragon Canyon was much wider and had less vegetation. The old jeep trail was much easier to walk on. The brochure mentioned that there were pictographs and petroglyphs on the canyon walls. We found those after hiking for maybe a quarter of a mile. There was a wooden fence in front of them. There were many different drawings, but I'm not super interested in Native American Art so I didn't take many pictures. In fact, I didn't even get a picture of the famous drawing that is supposed to look like a dinosaur or dragon. I was interested in the cave that the brochure mentioned. The brochure said, "At your own risk, hike along the rockfall to find a secret cave rumored to be the dragon’s lair." 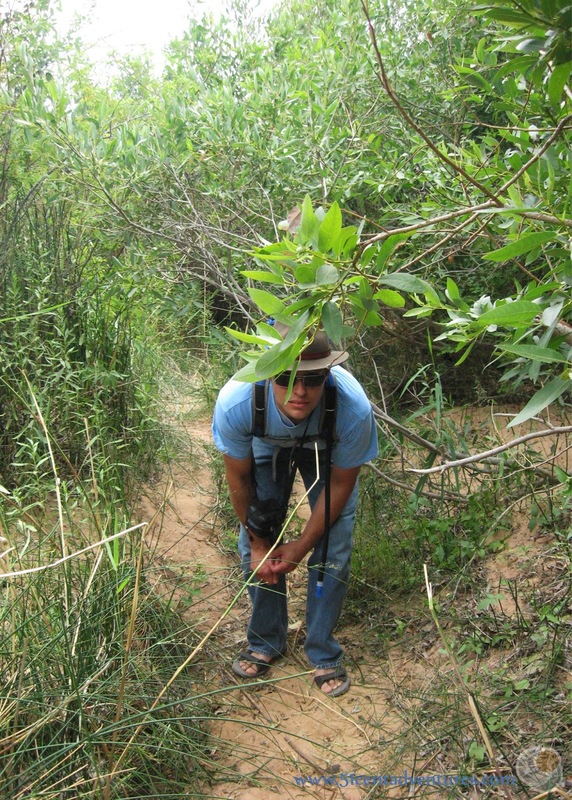 We interpreted that to mean that we would have to keep on hiking up the jeep trail. However, as I've researched this post I've come across a few online messages mentioning a large cave with an entrance to the left of the Dragon petroglyph. 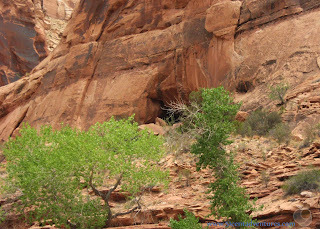 According to a thread on Bogley.com the cave is a deep alcove that had the front end collapse making it into a cave. The entrance must not be very noticeable because we never saw it. However, images that I've seen of the cave are pretty cool so if I'm ever back in the area I plan to try and find the entrance. We did however find another cave farther up the canyon. I'm not sure how far we went, but it was probably another mile or so. We'd actually decide to give up on finding the cave, and had turned around to start hiking out of the canyon when we saw a cave entrance. 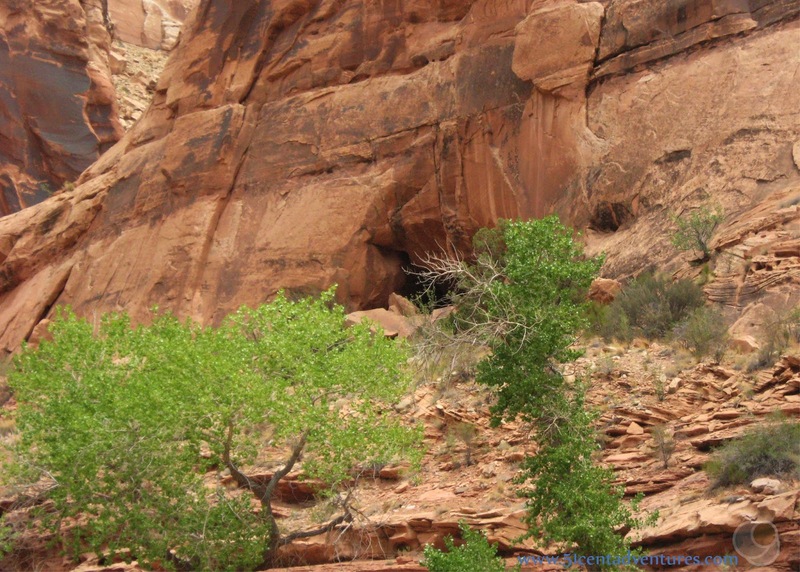 This cave was located on the southern side of the canyon on a western facing rock face. We hiked up the the cave and found it to be a large alcove. There was an area that went back for a little ways. We congratulated ourselves on finding the cave, and then hiked out of the canyon. Along the way we talked about how great it had been to do some exploring without bringing the kids and all their gear along. We'd really enjoyed taking this opportunity to remind ourselves of why we love to travel and explore new things. Recommendation: Hiking in Black Dragon Canyon was a fun little side trip, and a nice way to end our weekend in Moab. I really liked that we didn't see anyone else the whole time we were in the canyon. Black Dragon Canyon is a great option if you get sick of the crowds at the various state and national parks in Southern Utah. If you are travelling to Black Dragon Canyon from the west you will have to pass mile marker 147 and turn around at Exit 149. Then back track the way you came and exit at the dirt road. Due to the canyon's remote location I had trouble getting google maps to show you it's exact location. Here's the best I could do. If you zoom in you should be able to see the dirt road that will take you to the canyon. Follow the directions listed above and you should be fine. Additional Information: Black Dragon Canyon gets its name from the rock art depicting what seems to be a dragon or dinosaur. In recent years, studies have been done to show that the image is actually five different images that were incorrectly grouped together by early explorers. You can read more about that in an article published by Live Science. Places Nearby: There are other canyons near Black Dragon Canyon. 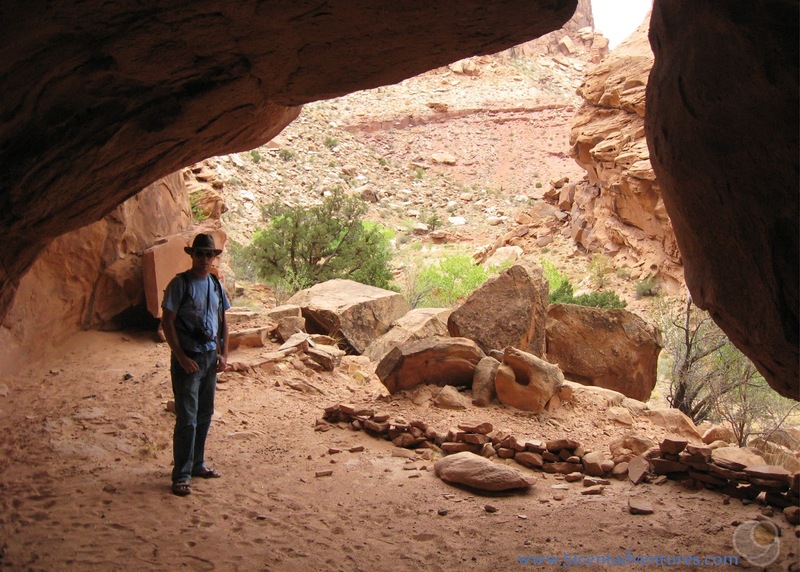 Petroglyph and Double Arch Canyons appear to be the most popular. 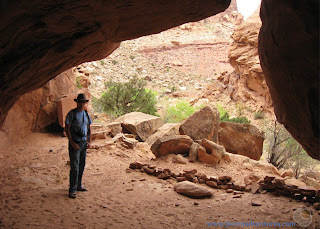 Roadtripryan.com has more information on how to reach those canyons and what to expect from your visit. Next Stop: The San Rafeal Swell - what we saw from I-70 and what I wish we'd had time to explore.